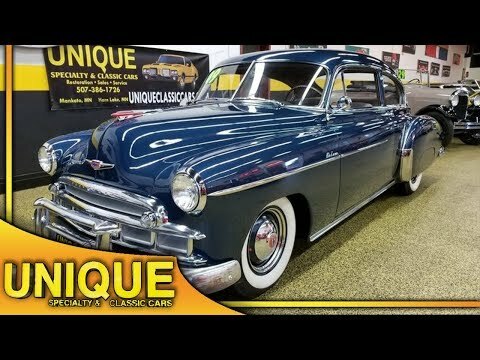 1949 Chevrolet Fleetline 2dr, runs great! TRADES? If you're looking for a nice "driver quality" Chevrolet Fleetline check out this 1949 that just came in and is available to purchase! It's the Deluxe model 2 door sedan still powered by a Blue Flame inline 6, 3 speed manual transmission with shift on the column. The exterior of this car has beautiful smooth curves with chrome and stainless trim. The paint is in very nice shape and has a nice luster to it. The chrome bumpers do show their age as well as some of the stainless. (see pics provided) The interior has been reupholstered and carpeting replaced but the dash still retains a lot of its "factory" look. The headliner is in nice shape and not full of holes or tears. The inline 6 in this car runs smooth and it goes down the road as you expect from a nice 49 Fleetline. You can check out the video provided to see a walk around of the car and hear how smoothly this car starts and runs. These have become very popular and it's getting harder and harder to find ones that haven't been "chopped' and/or "street rodded" We don't expect this one to last long so if you're looking for one cool looking car to cruise in or take to shows give us a call at 507-386-1726 or email "sales@uniquemankato.com" TRADES WILL BE CONSIDERED AND FINANCING IS AVAILABLE.